Saginaw citizens trapped in fires hopefully now have a better chance of surviving. 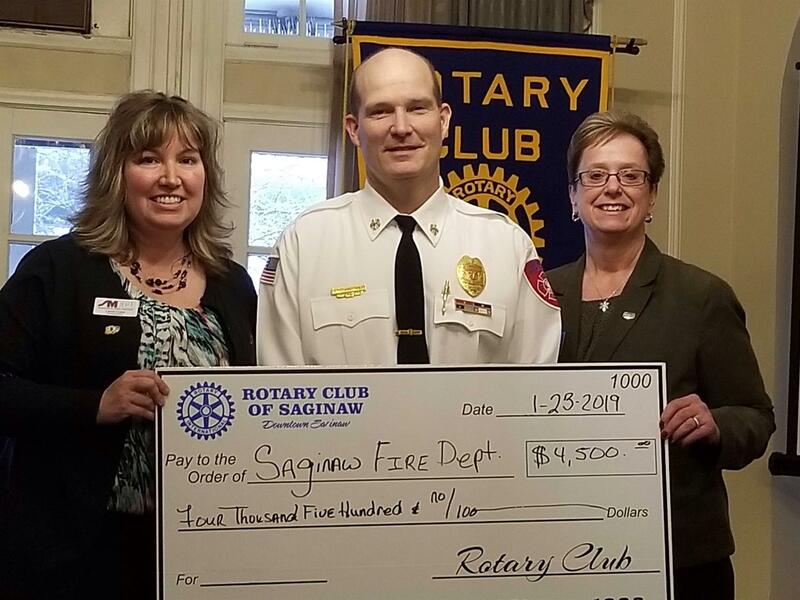 In January 2019, the Rotary Club of Saginaw -- Downtown presented the City of Saginaw Fire Department a check for $4,500 to purchase four thermal imaging cameras. Fire Department Chief Chris VanLoo (pictured, center) called the frontline apparatus a wand-like device with a small screen that upon arriving on the fire scene can be used to scan and locate any people trapped inside. So far this year alone the department of 38 firefighters has been called to 16 fires. And it is under severe budgetary struggles as well. VanLoo said when he began 28 years ago there were 100 firefighters on duty. The money for the donation was raised by our club's annual golf scramble fundraiser ....so again thanks to all who participated in that September event. At left is club secretary Laura Crase and at right club president elect Cathy Tafel.